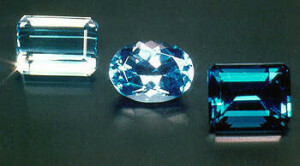 Topaz gemstones with varying colors. 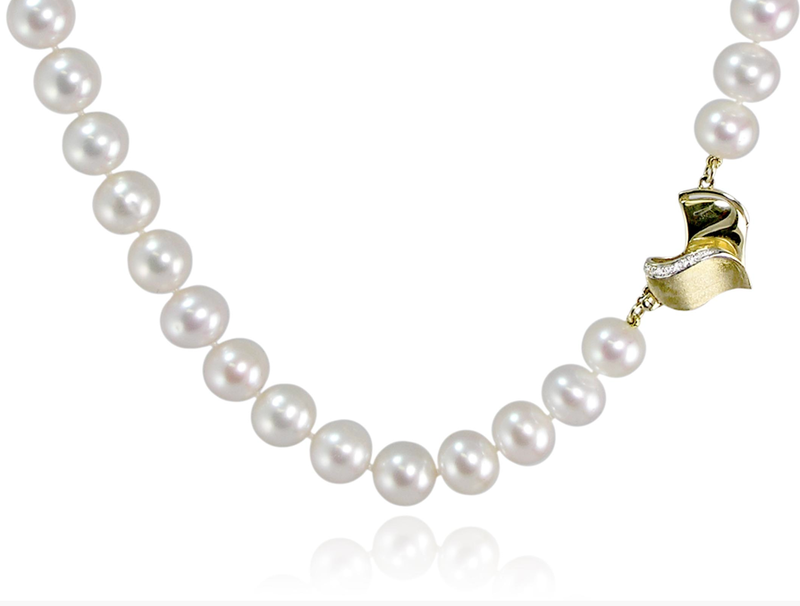 The topaz is the traditional birthstone for November, with citrine having been recently added as a secondary stone. 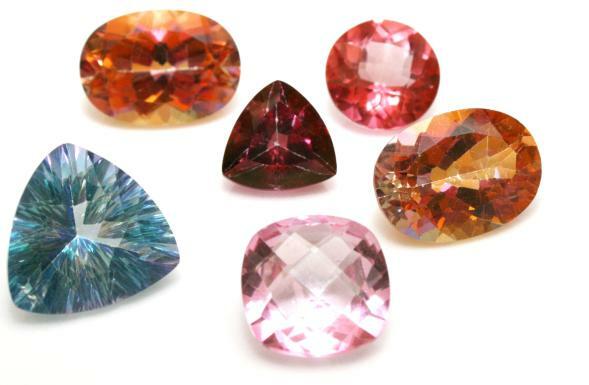 Topaz colors include clear, brown, yellow, orange, pink, and red, as well as the well-known blue topaz. 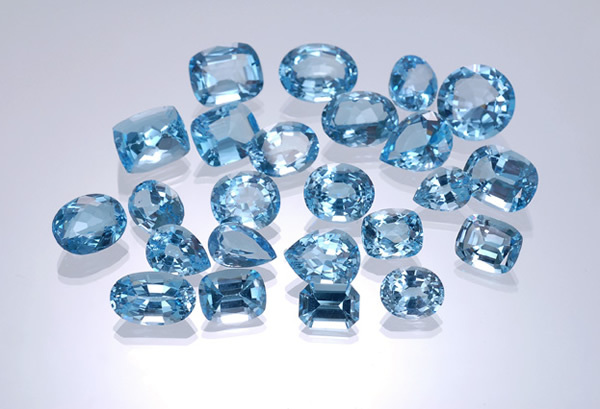 Many examples of topaz seen in jewelry are treated to bring out the color, as topaz is most often found in pale and light colors. 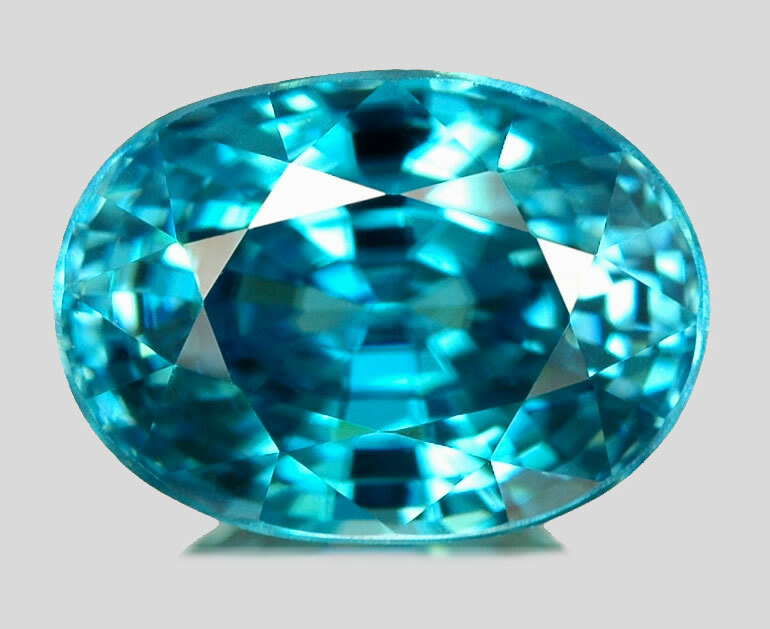 This is especially true in blue topaz. 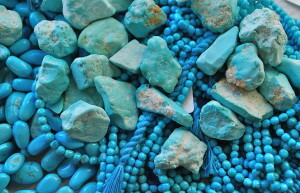 The topaz on the right has been treated to bring out the bright blue colors within the stone, while the topaz on the left is a closer representation of its natural color. 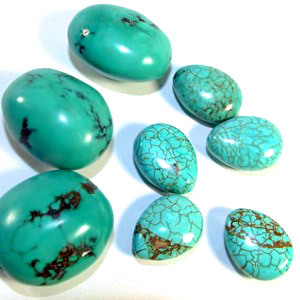 This stone is found in many countries around the world, with the most common source being Brazil. 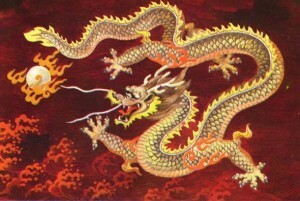 It is a symbol of affection, has an interesting history of legends, and holds a few interesting metaphysical properties. 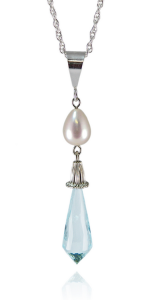 Topaz has been said to increase strength, fight against insomnia, cure asthma, and improve eyesight. 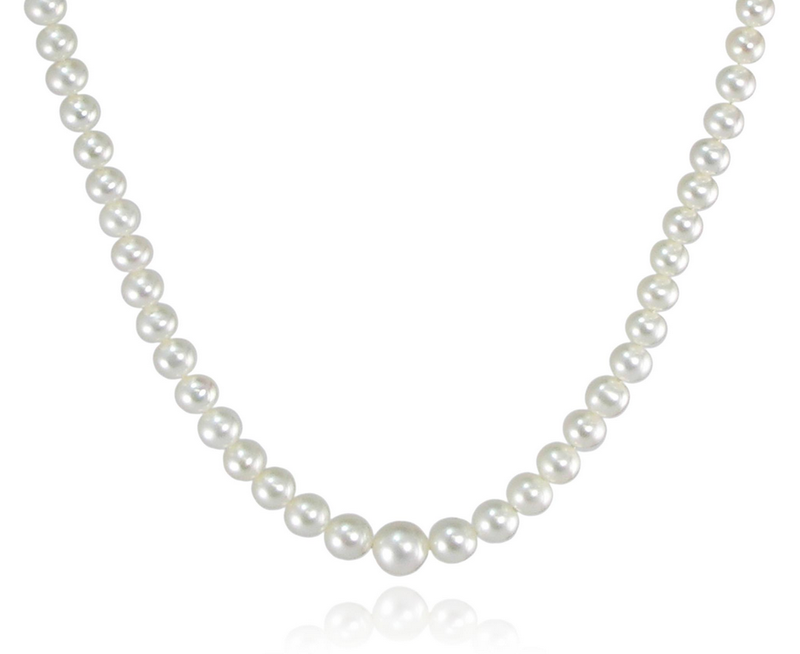 The ancient Greeks believed that this stone held the power to make the wearer invisible in an emergency. Both the Egyptians and the Romans associated topaz with their sun gods (Ra and Jupiter, respectively). The Egyptians believed that it was colored with the energy of Ra, and regarded it as a very powerful amulet to protect against harm. 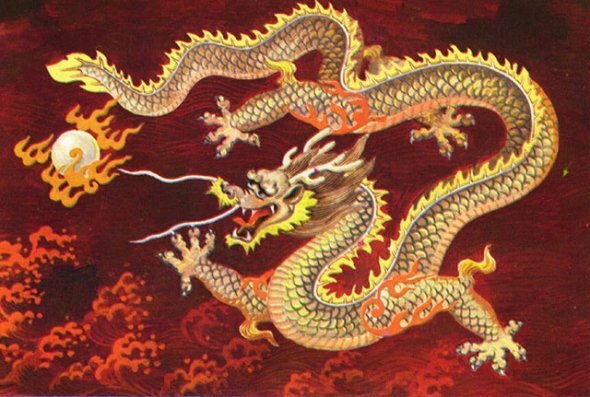 These legends more than likely refer to yellow varieties of topaz, as well as citrine, which was once confused with similar specimens of topaz, although they are unrelated. 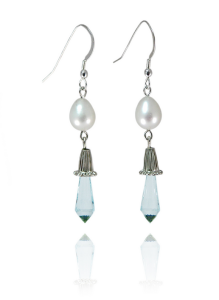 Need a piece of topaz jewelry for a gift? 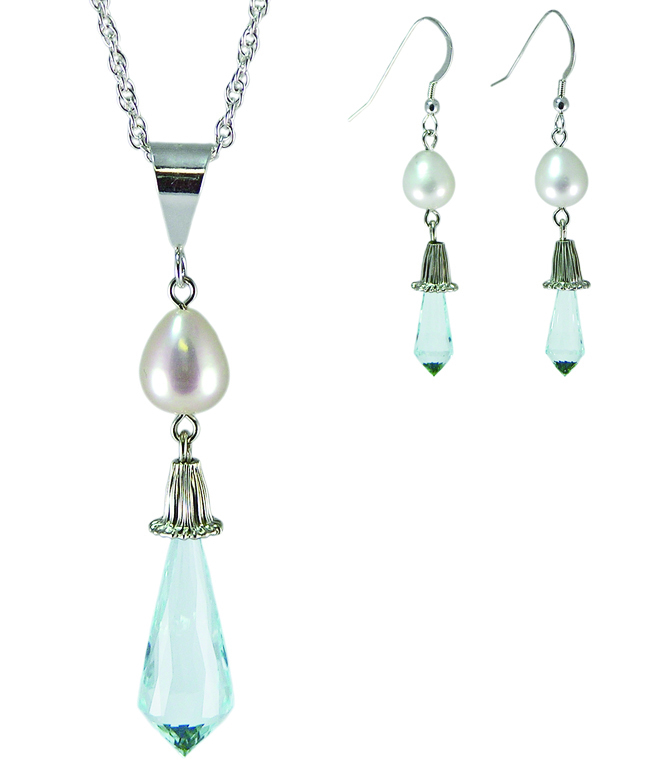 We have a gorgeous topaz pendant and earring set, in natural, untreated, hand faceted blue topaz. 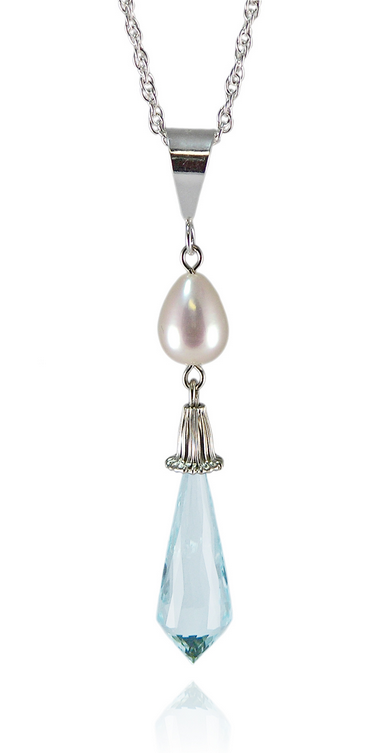 Pearls International blue topaz and freshwater pearl pendant. 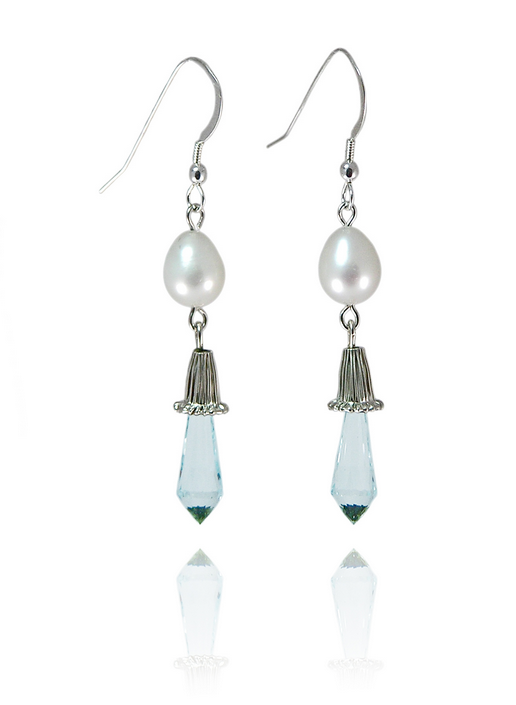 Freshwater pearl and natural blue topaz earrings. 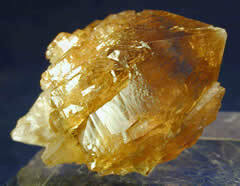 Citrine, the second stone for November, is the yellow or orange variety of quartz. 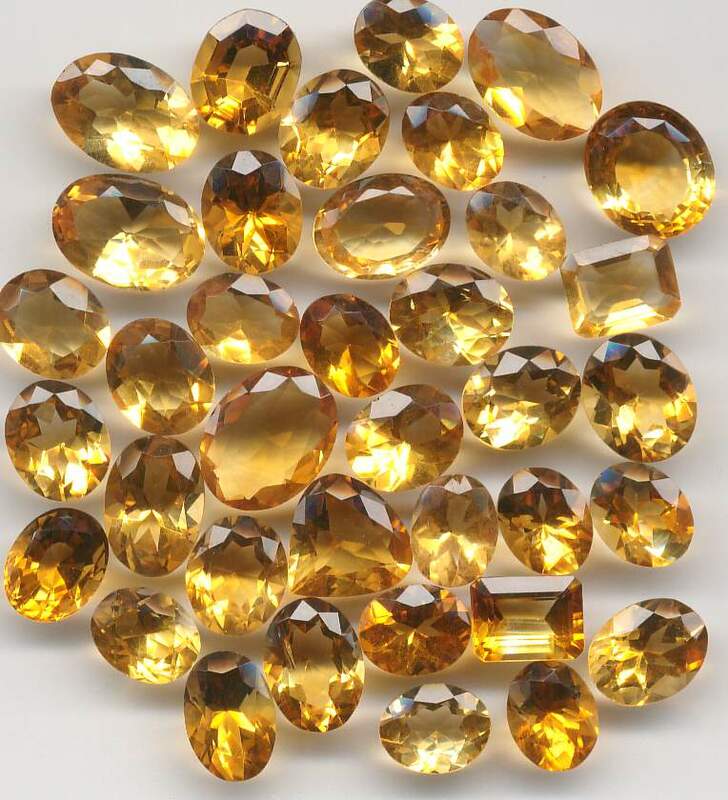 The word citrine comes from the French “citron,” meaning “lemon.” Naturally yellow citrine is primarily found in Brazil and Madagascar, although some of the citrine market today is actually heat-treated amethyst. Citrine’s sunshine-like color has earned it a spot regarded as a positive energy stone, and it is thought to cure depression and radiate success, prosperity, and abundance. These qualities have given citrine nicknames such as “merchant’s stone” or “success stone,” and many places of business keep a citrine stone at the cash register. Amongst other metaphysical properties, citrine banishes negative energy, and will never absorb negative energy from its surroundings, meaning it never needs to be cleared or re-charged. 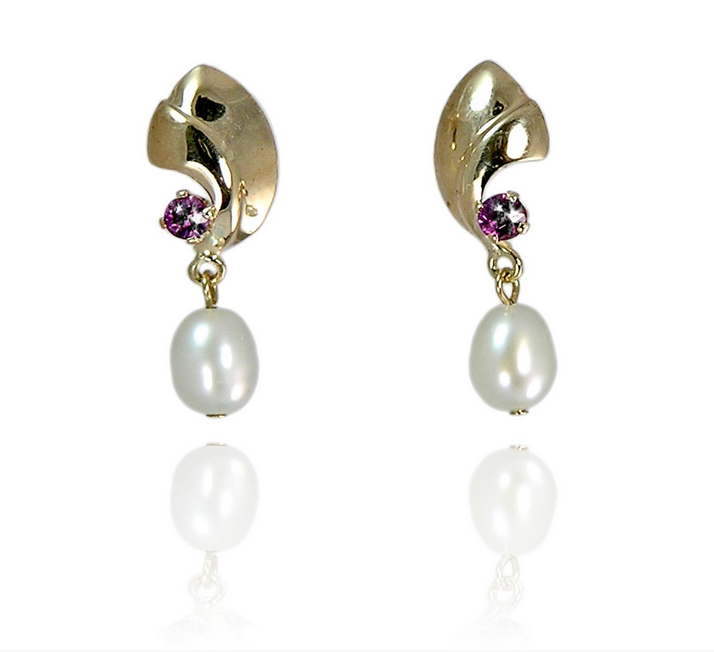 The healing properties behind the stone are endless, both mentally and physically. It can relieve emotional trauma, repel nightmares, aid in digestion, help overcome addictions, and promote self confidence. 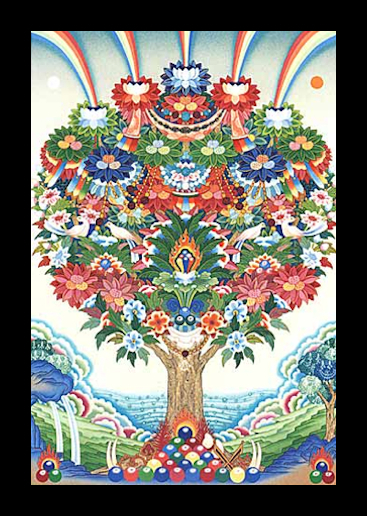 It is said to carry the power of the sun with it. April girls may consider themselves lucky to be born with such a prestigious gemstone. If you have been following our blog for the last three months, you have probably learned a lot about the history of gemstones. 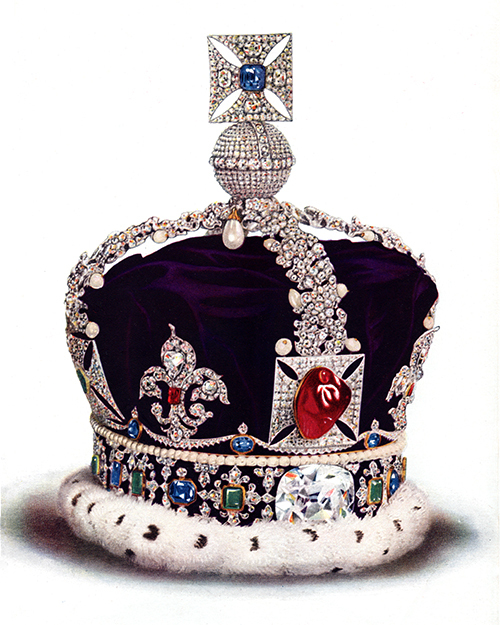 Knowledge on diamonds is a little more widespread than some of the other stones, as it is a popular stone in many pieces of jewelry. Many people know that diamonds are a symbol of eternal love, and are frequently used in engagement rings and wedding and anniversary bands. 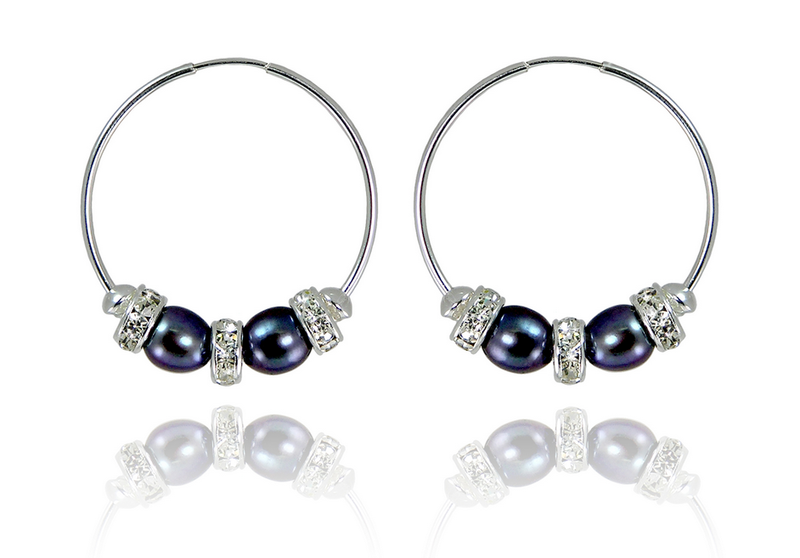 Many people also know that diamonds are one of the hardest substances known to man. Lesser known facts about the diamond include its history, the circumstances around its formation, and some of the mythology around the stone. 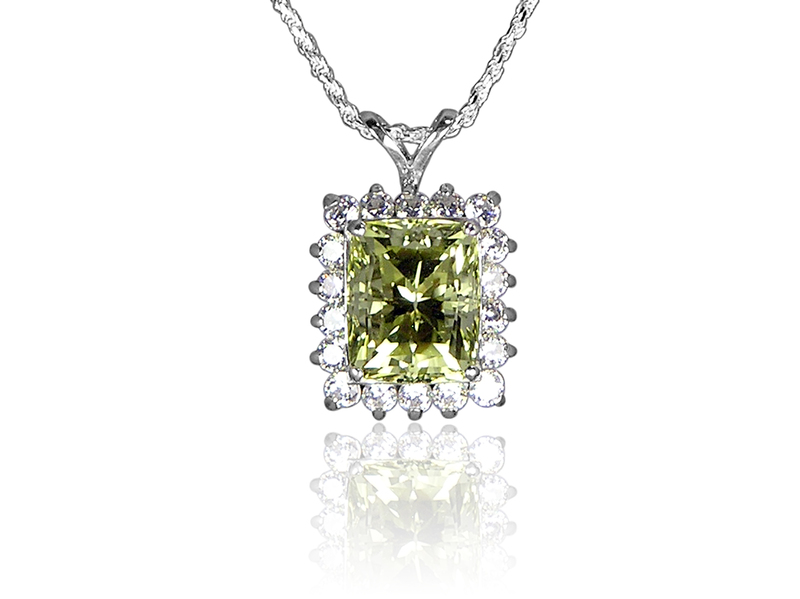 Diamonds are available in many colors. Here are some great diamond gift ideas for your April girl. Diamonds are also a traditional 60th wedding anniversary gift. 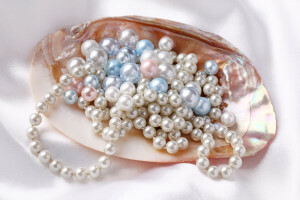 And pearls are always appropriate! 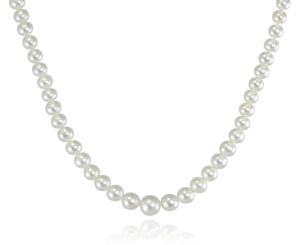 Classic strand of large pearls with a 14k gold and diamond clasp. 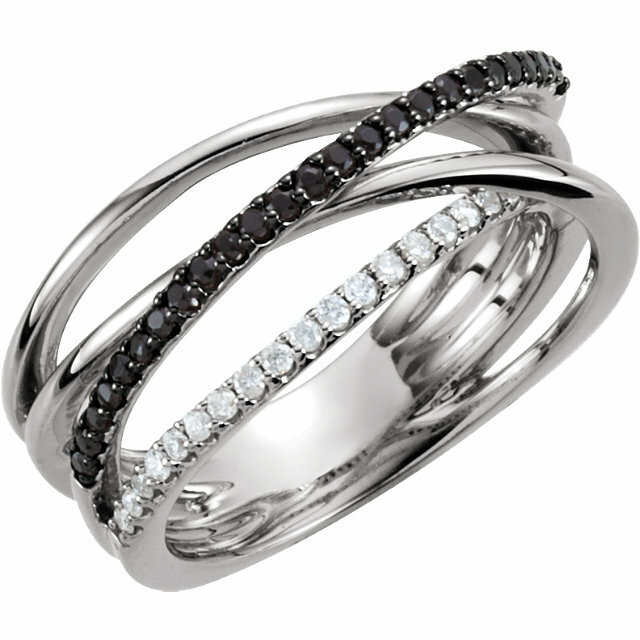 Are diamonds a little out of your price range, or are you thinking of trying something a little less traditional? Try a bloodstone for your aries girl or a sapphire if her birthday falls under the taurus sign. 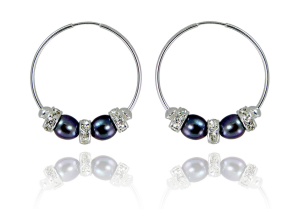 We also offer a selection of synthetics (cubic zirconia and swarovski crystals) that shine just like a diamond! 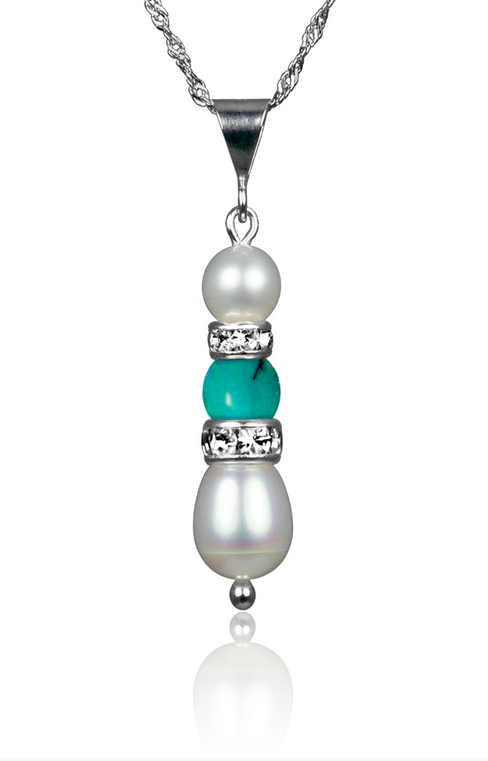 Recognizing each month as having it’s own “birthstone” is a tradition that has been around since the 15th century. 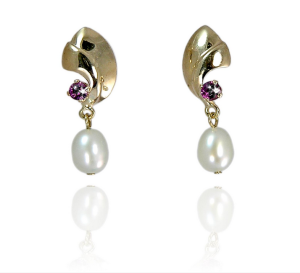 This is the first in our series of birthstone blogs, designed to give you in insight into the history and meanings behind the birthstones for every month. Garnet, January’s birthstone, is unique in many ways. 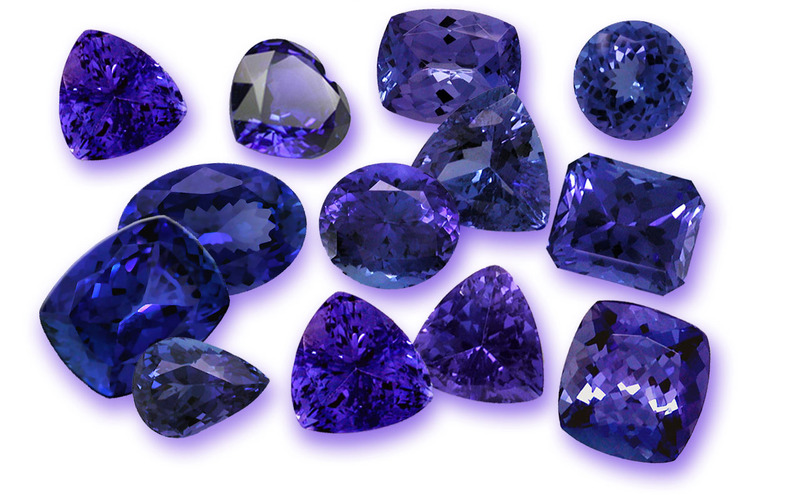 January is the only month that has not had any additional stones added as secondary birthstones, or had the stone change. What’s even more impressive is that garnet comes in every color of the rainbow. 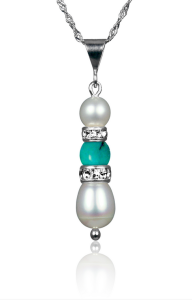 Think of all the possibilities January babies have for their birthstone jewelry! 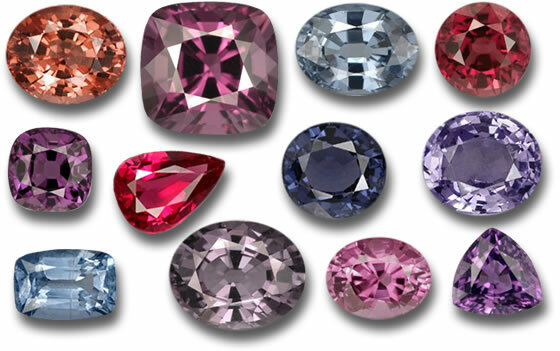 Some of the amazing colors garnets come in! If you’re looking for a piece of jewelry to give as a gift, garnet is an excellent choice because it signifies values such as friendship, loyalty and trust. 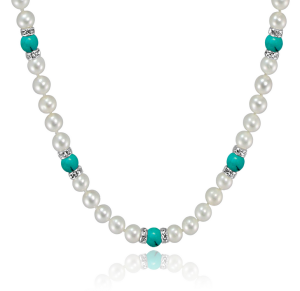 It is also thought to keep the wearer safe during their travels. 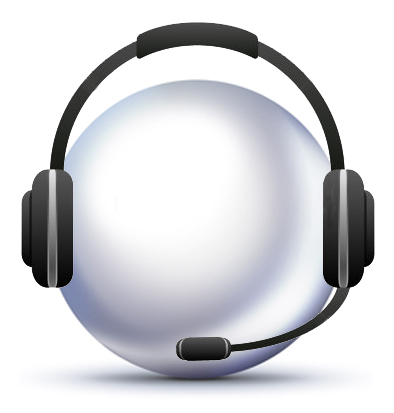 Metaphysically, it is thought to remove negativity and provide insight and guidance. Garnets are also a traditional gift for a second wedding anniversary. Garnets are a group of hard, glassy minerals. There are actually 17 different varieties, all valued for their different colors, hardness and other special properties. For example, color-change garnet appears brownish or orange in the daylight, but rose-pink in incandescent lighting. Leuco garnet is entirely colorless. 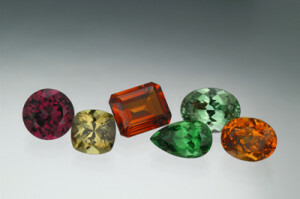 Garnet varieties found in green are the most uncommon and most valuable. The most common color garnet manifests itself in is red, and that is the stone most people picture when the word garnet is mentioned. 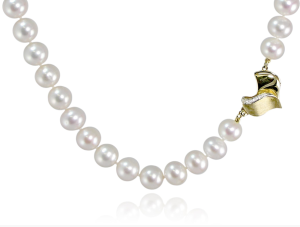 Looking for the perfect gift for your January girl? Browse our selection of garnet jewelry. Our garnet and pearl strand with swarovski crystals.